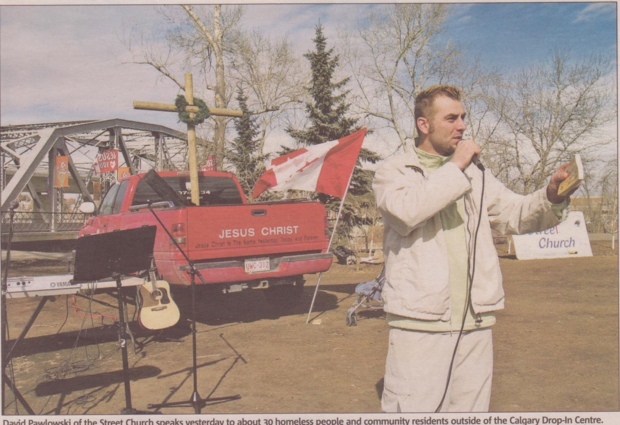 Vithiin 48 hours of a drug-related double-homicide under the 5 Ave. flyover, members of Calgary’s con-troversial Street Church gathered yesterday to preach and offer condolences to community members outside of the Calgary Drop- In Centre. 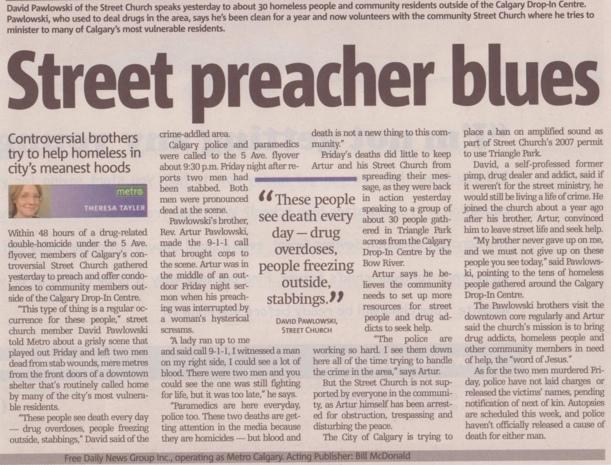 "This type of thing is a regular occurrence for these people," street church member David Pawlowski told Metro about a grisly scene that played out Friday and left two men dead from stab wounds, mere metres from the front doors of a downtown shelter that’s routinely called home by many of the city’s most vulnerable residents. "These people see death every day – drug overdoses, people freezing outside, stabbings," David said of the crime-addled area. Calgary police and paramedics were called to the 5 Ave. flyover 9 :30 p.rn. Friday night after reports two men had been stabbed. Both man were pronounced dead at the scene. Pawlowski’s brother, Rev. Artur Pawlowski, made the 9-1-1 call that brought cops , to the scene..Artur was in the middle of an outdoor Friday night sermon when his preaching was interrupted by a woman’s hysterical screams. "A lady ran up to me and said call 9-1-1 Iwitnessed a man on my right side, I could see a lot of blood . There were two men and you could see the one was still fighting for life, but it was too late," he says. "Paramedics are here everyday police too.These two deaths are getting attention in the media because they are homicides – but blood and death is not a new thing to this com- munity." Friday’s deaths did little to keep.- Artur and his Street Church from spreading their message, as they were back in action yesterday . speaking to a group of about 30 people gath- ered in Triangle Park across from the Calgary Drop-Jn Centre by the Bow River. Artur says he believes the community needs to set up more resources for street people and drug ad- diets to seek help. "The police are working so hard. I see them down here all of the time trying to handle blood the crime in the area," says Artur. But the Street Church is not supported by everyone in the community, as Artur himself has been arrested for obstruction, trespassing and disturbing the peace. 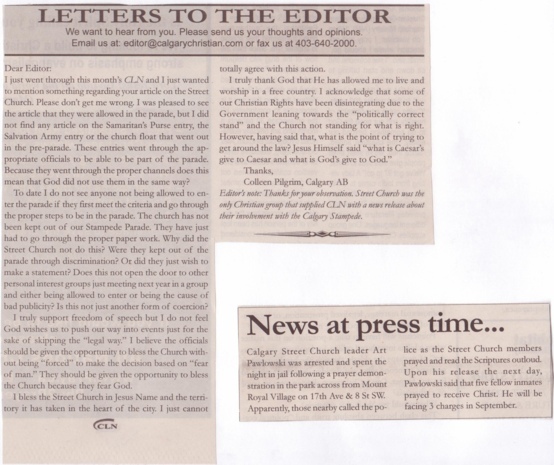 The City of Calgary is trying to place a ban on amplified sound as part of Street Church’s 2007 permit to use Triangle Park. David, a self-professed former pimp, drug dealer and addict, said if it weren’t for the street ministry, he would still be living a life of crime. He joined the church about a year ago after his brother; Artur, convinced him to leave street life and seek help. "My brother never gave up on me, and we must not give up on these people you see today," said Pawlows¬ki, pointing to the tens of homeless people gathered around the Calgary Drop-Jn Centre. The Pawlowski brothers visit the downtown core regularly and Artur said the church’s mission is to bring drug addicts, homeless people and other community members in need of help, the "word of Jesus." As for the two men murdered Fri¬day. police have not laid charges or released the victims’ names, pending notification of next of kin. Autopsies are scheduled this week, and police haven’t officially released a cause of death for either man.